A series of bike projects has taken place here on global-flat, starting with the Trindad bike project, which ended up with 2 finished bikes for needy up n coming riders, followed by the Barbados bike project still underway, then the American bike project in which four bikes are underway, and finally the Panama bike project for help to replace the worst bike in living history with a nice modern flat rig. 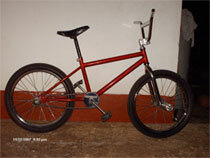 Momentum is increasing as more riders pitch in and help our flatland brothers in countries not so well off. Even companies are putting their weight behind this with assistance from FF, The Byke Project, and an offer from Kunstform. The camaraderie of the global flatland community is growing from strength to strength, and the increasing amount of giveaways adds fuel to the good vibes.